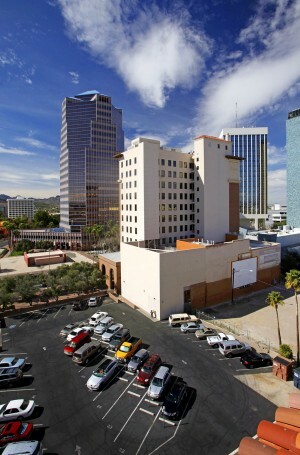 The RTA, the biggest investor in the Tucson modern-streetcar project, is planning to move into a new, streetcar-oriented building downtown. Robert Caylor Construction Co. is developing a six-story building at the northeast corner of Broadway and Stone Avenue. Caylor’s One East Broadway building will have parking, street-level retail, offices and 39 apartment units. It will also have the taxpayer-funded Pima Association of Governments and Regional Transportation Authority as its main tenant. PAG and the RTA share space and staff. Caylor, which specializes in urban infill developments, also owns 2 East Congress, the Chase Bank building next door. The design of the new building will complement the look of its historic neighbor but will be more modern, said owner Rob Caylor. He said he hopes to start construction this fall, for the building to open around the same time as the modern streetcar late next year. A streetcar stop will be across the street from the building, and that’s a major reason why PAG and the RTA want to move to the new building, said executive director Gary Hayes. The RTA is the biggest investor in the streetcar project and wants to locate its offices directly on the streetcar line, he said. For 25 years the PAG has leased space at the Transamerica building, a third of a mile north of the new site. The PAG regional council approved an informal letter of intent to lease the third and fourth floors of the new building. The council will need to approve a formal lease agreement in the spring. The letter of intent shows a price of $26.50 per square foot, but that could come down to what PAG is paying at the Transamerica building, about $18 per square foot, after discounts for tenant improvements, Hayes said. That would give PAG/RTA a newer, slightly larger, more efficient space for around the same price, he said. The Pima Association of Governments was formed in 1972 in response to a federal mandate for local councils of government to review applications for federal funding. Its nine-member board is made up of representatives of each recognized local government. Contact reporter Becky Pallack at [email protected] or 573-4346. Read original article in the Arizona Daily Star.